Did you miss a post in this series? Read parts one, two, and three. Of course, time-out sounds easy . . . until you try it. It’s then that the yelling, screaming, kicking, and running away start. Time-out is effective for children ages eighteen months and older. If your child gets off the chair, put him back in the chair. If you go through THREE consequences, then finish time-out the best you can and follow through with the consequences. Usually one time of having to experience three consequences is enough to teach your child that staying in the chair is worth it! Your child must be quiet in time-out. OK, THIS is a hard one. It’s still hard. My younger children cry, and my six-year-old likes to argue. Let your child know she must be quiet in time-out, but if she isn’t, just ignore her. Do not give continuous commands to quiet down. Do not yell. Do not lecture. (This is hard.) Just ignore your child’s noise or words. Eventually your child will be quiet. It’s not fun arguing when no one responds! We have gotten to the place where my children are mostly quiet in time-out. Sometimes, I do give one reminder. Sometimes, if they refuse to quiet, I will add more time to the timer. Your child stays in time-out for one minute for each year they are old. Two years old = two minutes, etc. Remember the key is that your child is missing the FUN! If your child is in time-out, go and play with the other kids. Your child may consider it “teasing.” (I’ve heard this.) But it’s reinforcement. If you are having trouble with any of the rules, model time-out again with Mr. Fluffy, reinforcing the rules. If your child does not go to the chair on his own, you can help him, guiding him gently. Use a kitchen timer for YOURSELF. I’ve forgotten to use a timer before, and my kids have stayed in time-out for more than ten minutes. Ooops! But use the timer as a reminder, not as the end of time-out. You are the one who gets your child out of time-out. You may need to reset the timer for children who know the time-out routine—and who’ve been following it—but one day try to test it by getting down or screaming during time-out. They will discover that having the time reset is not fun! 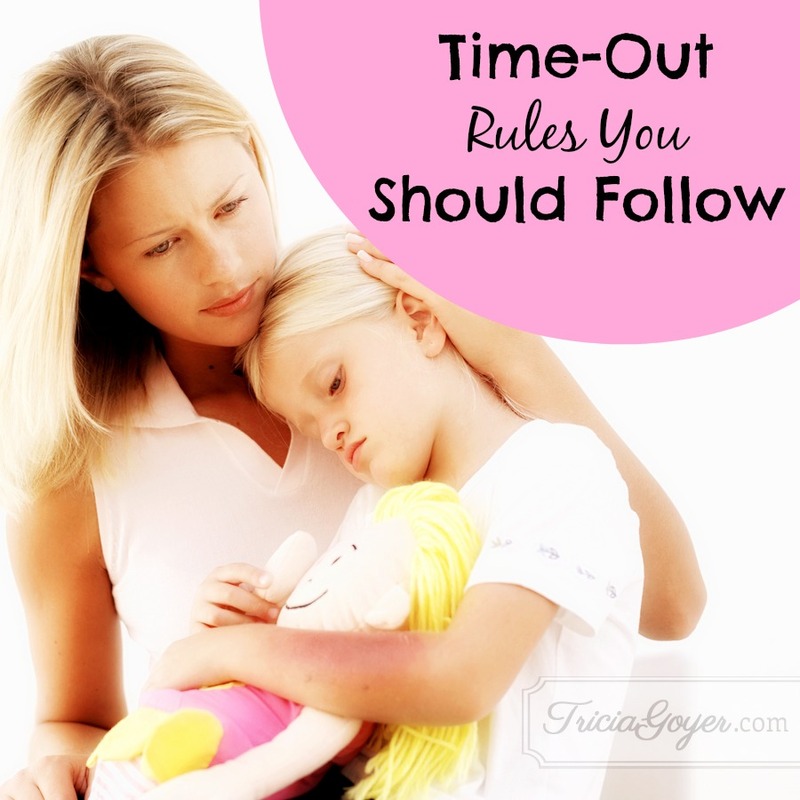 Sending a child to time-out must happen immediately after the unacceptable behavior occurs. Having it happen later does NOT work. Don’t let bad behavior build. Nip it in the bud with the first unacceptable behavior. If you let the behaviors escalate to a tantrum you will not be able to have an effective time-out. At first your child may scream and cry, but when she realizes this doesn’t work, this behavior should stop. All protests, fussing, promises to be good should be ignored, too. Your child might say stuff like, “I want to sit here. I like it.” This should be ignored, too. Eventually your child should be able to go to time-out on her own, sit there quietly, and wait for you to come. This may seem like a dream, but it can be reached! The next post will talk about what to do when time-out is over. I’d love your thoughts so far! My child does not go to timeout independently. There is no gently guiding. He is two and will kick, hit, bite, scratch or do whatever it takes. He will hide in places that are hard to get him, like next to the bathroom vanity or under beds or the top of the bunk beds in the far corner. I have marks from putting him in timeout, as does he. I have buckled him in his kitchen chair, put it in the middle of the room and left, but getting him there is pretty hard on both of us. Please help. I’m not an expert just a mom. But it seems as if he is getting a lot of attention when he acts up. Another thing our therapist did was have me be exuberant with praise over every little thing. Give LOTS of attention over the good deeds and see if that helps. I would focus on doing that for a while and not worry about time-outs yet. These seem like they’re great ideas for young kids but my almost 9 year old needs some work on his respect. I can tell he tunes me out during lectures. He hears voice all day as I’m teaching and reading. He interrupts when he’s bored. Time outs mean time away from work. I’ve been trying “blessing bucks” to reinforce good behavior. They lose privileges when assignments don’t get done or attitudes are bad. But it doesn’t seem to be helping. I hate the negative tone in the house. Any ideas?? I love the ideas of Blessings Bucks! Keep up trying. Also really start praising when he is quiet. The praise will make a big difference! I really appreciate this series! I’m a Mom of a 3.5yr old, a 2 yr old, & a 3mo old and frankly, I am tired! I’ve known our current discipline tactics have not been effective, but I’ve been so overwhelmed & exhausted I didn’t even know how to change. This has been a great, systematic, straight forward explination, and I’ve been putting it in to practice the past few days. And although I’m not seeing a ton of improvement just yet, I feel calmer, more in control, & more intentional in my parenting. And in just the last few days, I can see how my kids are now staying in the timeout chair the whole time, as opposed to running off. And even though they may be screaming bloody murder while on there, as soon as time-out is over they quickly & cheerfully are doing as asked (whatever it was they didn’t do that got a timeout). It’s small improvements, but it is improvement nonetheless & I feel like I now have a clear path to follow, as opposed to blindly groping for SOMETHING to work. Thank you so much! You are so welcome. That is awesome!!! I’m so glad that this has been helpful!! Thank you for writing this series in so much detail. As far as “methods” go, I like time-out. It definitely feels better than hitting/yelling/shaming. But my constant struggle with any discipline method is that I worry about the ramifications about what it’s teaching them re:my love, God’s love, the need for approval for actions, etc. I can only imagine how much more you’ve had to think these things through then me. My kids are 2, 4, and 6. I know we’re at a point where I need to do SOMETHING more than talking them to death and redirecting them. Or maybe not? I dunno. I’m asking this not as a judgement, but a sincere question: do you worry that separating your children from you for misbehavior will affect your attachment? Obviously you have been consulting people who know all about attachment theory working with fostering and adoption. So they think that the consistency of clear expectations and consequences will outweigh any negative feelings your kids have about your disapproval? That is a great question! We have been working on attachment, too. We spend a lot of time together and I give the kids eye contact and follow their lead in play–very important. Disciplining through time-outs has actually helped the attachment. It’s a positive way to teach obedience and disobedience. After the time-out we talk about right behavior and we hug and go on with our day. The offense is forgiven and they’re able to start out fresh! This one is open to anyone answering. What do you do if your child is standing in the chair? I can tell she is doing it to get attention, but I am afraid she is going to fall off. Would it be okay to tie a scarf around her waist and to the back of the chair so she can’t move around or would that be counter productive? Most of her body needs to be in the chair for a time-out. Standing is not an option. I would sit her down and take away privileges for every time she stands–up to three times. After three times remove the child from time out and try to bring her back to obedience … but stick to taking away those privileges. Hopefully she’ll soon realize that losing a snack, a favorite toy, or a favorite show is not worth it. Taking 3 privileges away unfortunately does not seem to be helping. When she asks for the privilege that was taken away (kindle time, books, or string cheese for snack) and I say “no, because you stood up in time-out you do not get ____.” She just goes on to the next thing with no problem. Then she continues to stand up in the chair-I think because it gets our attention. I am not sure what else to do. Is she too young to understand the direct connection of immediate behavior to long term consequences? She’s 21 months old.